by Housewife on a Mission and sponsored by ECR4Kids! If you are a parent or grandparent, you know how easy it is for kids to make a mess of their toys. With the ECR4Kids 4 Tier Plastic Storage Organizer, you can keep your child’s playroom or bedroom easily organized. This storage rack comes with 12 assorted bins, 8 small and 4 large in 4 different colors: red, blue, yellow and green. It also features metal support bars for durability! Its assembled weight is 26 lbs and its dimensions are 37.50″ x 14.00″ x 33.00″. Housewife on a Mission had the opportunity to review this organizer, you can read her review here. 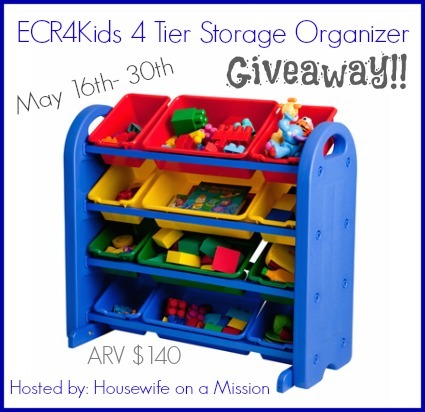 One lucky person is going to win a 4 Tier Plastic Storage Organizer by ECR4Kids! Open to US residents only, ages 18+ and ends on 5/30/14 at 11:59 PM EST.